Allbiomedical.com is a global B2B portal for biomedical and pharmaceutical industry. Allbiomedical.com provides the most comprehensive up-to-date supplier and product directory for biomedical and pharmaceutical industry. Users can browse up-to-date supplier and product information on everything related to Dental Instrument and Equipment, Pharmaceutical Machinery, Manufacturing Equipment and Services, Chemical and Material, Surgery and Endoscopy, Therapy and Physical Medicine, Medical Imaging, Cosmetics and Beauty Supplies, Medical Contract Manufacturing Services, Health Care and Nutritional Supplement, Medicine, Vaccine and Drug Delivery Systems, Services for Medical Industry, Medical Information Technology Products, Medical and Surgery Supplies, Physiotherapy/Orthopaedic Equipment, In-vitro Diagnostics, Hospital, Labortory and Clean Room Equipment, Electromedical Diagnostics Equipment, Packaging, Labelling, Printing, Barcoding Equipment, Component for Medical Device.Allbiomedical.com is a marketplace which connects your website to the most qualified buyers online─Being your sales for 24 hours a day and 7 days a week. 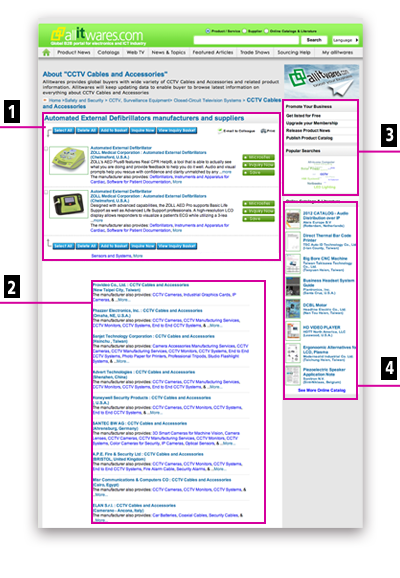 Search box with keyword, supplier, or online catalogs& tech notes. Users can search information they need to know with these function. 20 sectors cover everything related to biomedical and pharmaceutical industry, from medical device to therapy and physical medicine. Featured products are selected from advertiser’s microsite to draw visitor’s attention. It will increase exposure of the products. Also, this area will be rotated; therefore, when users enter Allbiomedical.com, they will see different products. Webcast is the best marketing tools for advertisers to catch visitor’s attention. 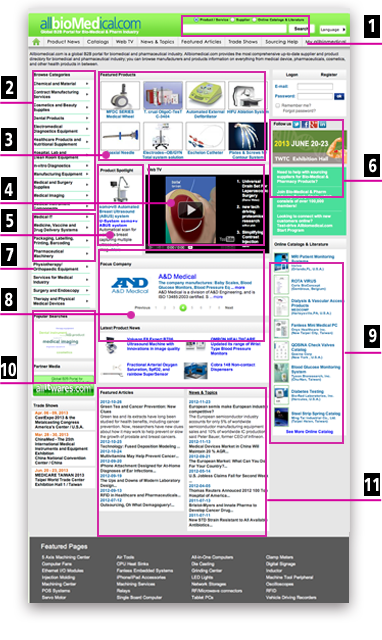 It enables advertiser to show their special/featured products on homepage of Allbiomedical.com. If advertisers want to present their featured products individually, they can display the products in this section. The latest trade show preview will be gathered from famous international trade show. It helps visitors to arrange their schedule. The most popular keyword searched by users will shown in Popular Search, and the size represents the number of times the keyword being searched. The tags are hyperlinks which lead to items that are associated with. Advertisers will have their company brief rotated here. All related biomedical and pharmaceutical product catalogs and literature will be rotated here; registered users can click in and download it or view it online. The material of catalogs and literature is selected from advertiser’s microsite. Files should be PDF file. The latest trade show preview will be gathered from famous international trade show. It helps visitors to arrange their schedule. Also, it will maximize advertiser’s exposure when users enter Allbiomedical.com. Design& Application Notes and Biomedical And Pharmaceutical Market News are posted or selected from professional magazines and on-line media all over the world, which makes users acquire product news and market news they want to know as long as they access allbiomedical.com. When users type the keyword of the product or supplier on search box, search engine will grab relevant information, and show it on result page, it includes advertiser’s product cards, free member listing, and some user tools. Complete Product Cards will be displayed on top position of search result page. Position ranking is according to membership grade. Advertiser’s product card contents a lot of elements. ‧A 50-word description of product information with image. ‧Product Categories of supplier offer. ‧Direct link to supplier’s company microsite in Allbiomedical.com. ‧User can query advertiser directly by clicking inquiry button. ‧Friendly and efficient business tools help user contact suppliers. Also, registered users can save the product cards to My Allbiomedical and manage your sourcing projects. Free members will be listed here, which makes users getting more opportunity to know the related companies which she/he searches for. Users can subscribe Allbiomedical Product Direct, register as Allbiomedical member, and find advertise information here. Biomedical Market News and Application Note are displaying latest news and article. Users can directly click in and view it. Each advertiser has their own microsite, and advertisers can display their company information and products as much as they like. There are 8 guide bars which let users search information easily: Home Page, Company Profile, Company News, Products Show Room, Products News, Catalogs & Tech Notes, Trade Show Information, International Contact, which is convenient for users to click and see. Contact information allows users direct click to your official website and to know more about your company. 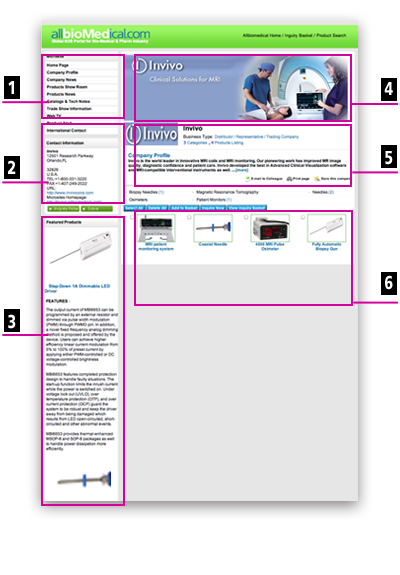 There are two selected featured products display on your microsite, and these two featured products could be chosen to rotate on the homepage of Allbiomedical.com. Moreover, advertisers can choose which product they would like to place. It will display the company image. The Company Banner AD is 680(W) x 200 (H) pixels. Company brief includes company LOGO, company name, industrial category and company brief, and it will directly let users know what the company is about. According to different membership, advertisers can post their product cards varies from 10 to 50 product cards. Also, registered users can save the product cards to My Allbiomedical and manage your sourcing projects. Worldwide Sales: Always provide you the premium service,please Contact Us.